If you need to find the disk ID or disk node identifier (like /dev/disk0s2) of a volume attached to a Mac for one reason or another, perhaps the easiest way to obtain this information from the command line is with the diskutil utility. Where “/dev/disk1” is the node identifier in question. This points out where the device location is, meaning whether it’s an internal or external drive, which can help narrow dow a volume when you have many disks or storage utilities attached to a Mac. The diskutil command is very powerful and has many uses for the Mac user who doesn’t mind navigating around within the command line. Yes, it’s a bit advanced, but given its potential and power, it’s sometimes the only way to get specific types of information quickly in MacOS and Mac OS X.
I remember wasting hours in discovering this command few months back to make a copy of downloaded OS X version. This is great, I like Eriks tip too with mount it is a bit more direct. Thanks. So . . I have two drives in a mac mini server. 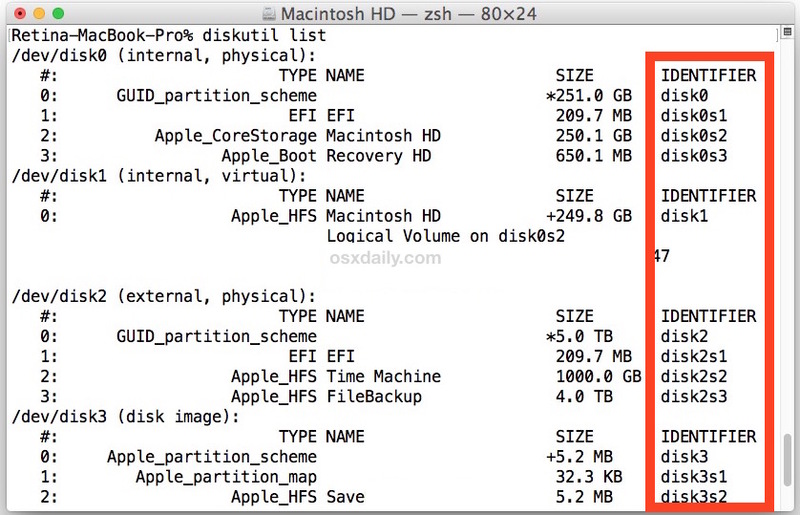 Disk Utility might report that one drive is bad or going bad along with its ID. How do I determine which drive it is without swapping them in and out? is, for example, DiskOs1 the top drive or the bottom drive? Diskutil will output that info as well.